War Memorials in Strathfield Municipality are dedicated to local residents who served or died during wartime conflicts. Most Memorials were built to commemorate World War I. Generally, plaques have been added to existing memorials for subsequent wars such as World War II, Korea and Vietnam. Almost all Australians who served abroad in World War I were sent to the front line of battlefields in Europe and the Middle East. Australian troops suffered a high rate of casualties [61,720 dead], which was nearly one in five of those who served abroad. Two thirds of Australian troops were either killed or wounded. The overwhelming grief of Australians coupled with the fact that many Australian servicemen and women died on foreign soil and did not have a final resting place, prompted local communities to organise the erection of War Memorials in local government areas. Though the objective of most War Memorials is to honour those who died, many Memorials also recorded the names of those who served. Most War Memorials were not built until many years after the war was finished. Memorials were usually organised by local committees who raised funds through public subscriptions [donations]. War Memorials can take many forms. Some involve outdoor large sculptures in public places, while others may be small plaques or stained glass windows contained in private property such as churches erected by families. Local schools such as Homebush Boys High and St Patrick’s College partly financed the building of Airey Oval and Hudson Oval respectively to commemorate their former students who died during World War II. 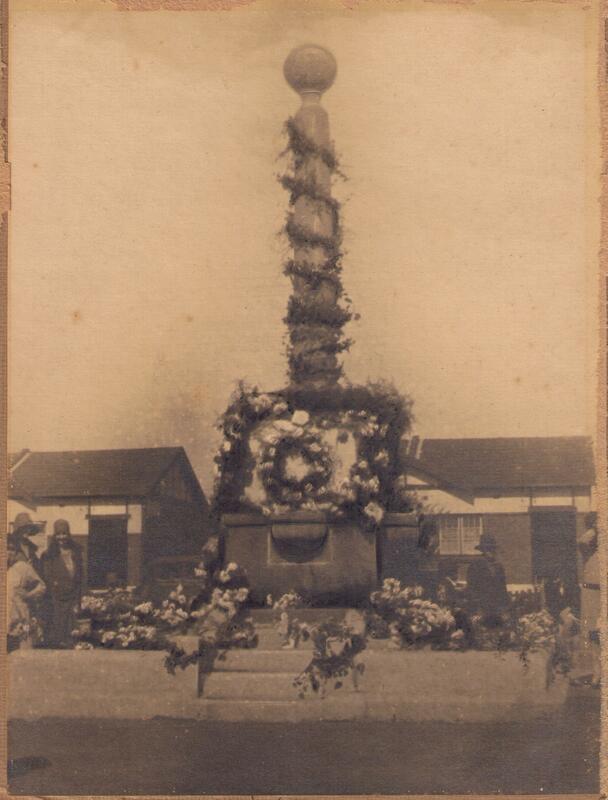 Many memorials were erected prior to the Council amalgamations with Enfield and Homebush Councils in the late 1940s. Therefore, memorials tend to record names of citizens who resided in the original Council areas. Memorials relating to the former Homebush and some parts of Enfield Council are located in Strathfield Municipality. Fox & Associates, Strathfield Heritage Study, 1986. Jones, C ‘War Memorials in Strathfield’, Strathfield District Historical Society Newsletter, December 2005. Strathfield War Memorial opening ceremony booklet, 11 October 1925, Strathfield Council. Stone, L., Reminiscing War Time Strathfield, Strathfield District Historical Society Newsletter Vol. 24 No. 7 July 2001.